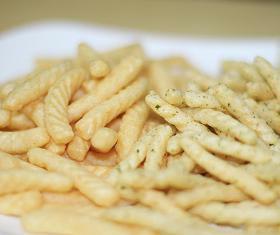 Saewookkang is considered one of the oldest and most popular snacks in Korea. It is about two-inches long in length, packed with savory andreal high quality shrimp flavors as opposed to artificial additives. It is slightly salty in taste and each piece is baked, forming tiny pores inside each cracker which makes it crunchy with every bite. Different variations from sprinkled herbs to hot & spicy shrimp flavors exist as well. Since Korea is a peninsula surrounded by sea, seafood flavored snacks are surprisingly popular and something which everyone enjoys. A bag of this beloved snack can be found in almost every Korean household and often served in popular bars much like how party mix goodies are served elsewhere. Saewookang was first introduced in 1971 and several billions of bags have been sold and consumed thus far.